We’d love your help. Let us know what’s wrong with this preview of Home by Ginny L. Yttrup. When novelist Melanie Vander faces a looming deadline, she decides it’s time for an escape to an inspiring, novel-worthy locale. She’s not running away. Really. She just needs time to focus. But as she disappears into her writing, she encounters a man whose tenderness leaves her reeling. Engaging and wise, psycholog Melanie runs away. From conflict. From pain. From reality. When novelist Melanie Vander faces a looming deadline, she decides it’s time for an escape to an inspiring, novel-worthy locale. She’s not running away. Really. She just needs time to focus. But as she disappears into her writing, she encounters a man whose tenderness leaves her reeling. Engaging and wise, psychologist Elliot Hammond tempts Melanie to question everything, including her marriage. But that’s ridiculous. Dr. Hammond isn’t even…real. Where did your inspiration for the multiple storylines and different POV come from? This is the first time I have read a book that had so many POV and so well written. I have recently fallen in a hole of christian-fiction and I cannot find my way out of it. Someone send a ladder cause I need to get out of here. and yeah, I reference The Path (that's what that's supposed to be), when I'm not obsessing over Hart of Dixie (we need more character development in books, movies and TV that's a-la Wade Kinsella style). Home features a very compelling story, told in a unique way. I really liked said story, but what I liked more was the style, and the w I have recently fallen in a hole of christian-fiction and I cannot find my way out of it. Someone send a ladder cause I need to get out of here. and yeah, I reference The Path (that's what that's supposed to be), when I'm not obsessing over Hart of Dixie (we need more character development in books, movies and TV that's a-la Wade Kinsella style). This is my first book by Ginny & it won't be my last. I adored every character. Home tells of a story of our journey to find a place in our own lives to call home. It really hit close to home for me coming out of a season of dryness. Melanie, Jill, Marcos & Craig were all such amazing examples of what struggle looks like when we don't go to God first. I throughly enjoyed seeing Melanie go through her struggle through her character Chloe. It just felt like the Holy Spirit was taking her t This is my first book by Ginny & it won't be my last. I adored every character. Home tells of a story of our journey to find a place in our own lives to call home. It really hit close to home for me coming out of a season of dryness. Melanie, Jill, Marcos & Craig were all such amazing examples of what struggle looks like when we don't go to God first. I throughly enjoyed seeing Melanie go through her struggle through her character Chloe. It just felt like the Holy Spirit was taking her through her struggles in a way that would impact her the most. It allowed for God to meet Melanie where she could handle all of her pent up life! Which we know God will meet us right where we are in our struggles. I gave 4 stars because I wanted to see more character development & the story line for them flushed out more. I wanted to see Jill's progress in more detail. Giving us a glimpse into the heart of her struggle. Just glad to find another Christian author who isn't writing romance novels! Home is about three different main characters: Craig, Melanie and Jill. Each of them have different issues that they've chosen to ignore rather than confront. The novel is about being willing to work through a problem rather than ignore it and the value in going through the process and finding the end result. This is my second novel by Ginny Yttrup. She tackles some tough topics and does a nice job with it. I especially liked the author quotes that began each chapter. Not only do I have a cold, but I have just been reduced to a pile of mushy tears when I finished this book! My poor nose! So many emotions while reading HOME. There was sadness, fear, trepidation, exasperation, empathy, sympathy, frustration and relief. I feared for Melanie and her husband Craig's marriage. I thought for sure that I knew where the author was going with their story, but in reality I had no idea. I experienced exasperation at Melanie's behavior...before I understood what she was go Not only do I have a cold, but I have just been reduced to a pile of mushy tears when I finished this book! My poor nose! So many emotions while reading HOME. There was sadness, fear, trepidation, exasperation, empathy, sympathy, frustration and relief. I feared for Melanie and her husband Craig's marriage. I thought for sure that I knew where the author was going with their story, but in reality I had no idea. I experienced exasperation at Melanie's behavior...before I understood what she was going through. I felt sympathy for their neighbor Jill and her husband Marcos. I admired the characters for getting the help that they needed, all in different ways. I admired Craig's faithfulness even when temptation assailed him. I admired Marco's in the way he supported his wife and encouraged her to seek help. Each character had a struggle, a hurdle to overcome and a grief to work through. "What Jesus suffered for mankind, for me, makes what I'm going through look trivial at best. Yet the Spirit assures me that God feels my pain--it isn't trivial to Him." Isn't it wonderful that we have such a relational God? I know this is a work of fiction, but so many truths were packed in it, so many poignant, gut-wrenching scenes, with characters that seemed so real that I felt like they were a part of my life. I didn't know what I'd be in for when I met Melanie, a forty-nine-year-old, midlist author who emotionally checks out of life and her marriage, getting wrapped up in her fictional stories in Home, a novel by author Ginny L. Yttrup. That is, I suspected I'd be in for something normal-but-fantastical like Stranger Than Fiction. So when I got into the novel and found it was pretty somber and wasn't fantastical, I didn't think I'd love it. I thought, "Oh, dear, so is this one of those melancholy stor I didn't know what I'd be in for when I met Melanie, a forty-nine-year-old, midlist author who emotionally checks out of life and her marriage, getting wrapped up in her fictional stories in Home, a novel by author Ginny L. Yttrup. That is, I suspected I'd be in for something normal-but-fantastical like Stranger Than Fiction. So when I got into the novel and found it was pretty somber and wasn't fantastical, I didn't think I'd love it. I thought, "Oh, dear, so is this one of those melancholy stories where everybody's giving each other sad smiles while they're inwardly rehearsing all the ways their lives are unraveling or burning to ashes?" Nothing against folks who do like melancholy novels, but I usually need comedy, thrilling twists, or something else more in contrast to balance it all out. Otherwise I feel like a book full of dry gloom is killing me softly. But this novel, as it dug through dark, tough issues, softly gave me life, after while. Yes, I, a writer, tend to be partial to books and movies that get real about writers. But this novel gets real, period, in a way that isn't sparkling but is still engaging. Well, I can't say that I personally found the pages of Melanie's manuscript the most interesting, since I wasn't invested in her characters, but the manuscript's effect on Melanie is so key. This is a beautifully written story that gave me a "God is here" experience that I don't get with all books. And, yes, I loved it. "Home is the imprint on our heart, the song of our soul, the memory we've yet to live . . . ."
Melanie Vander has packed her suitcase and virtually run away from home to her friend's lake house, cowering under the pretense of completing her novel under deadline, when in reality she recognizes that she and her husband have slowly drifted apart; thoughts of the future so confusing that it seems safer to escape into the alternate reality of her work in progress. But there is no solace there, either. "Home is the imprint on our heart, the song of our soul, the memory we've yet to live . . . ."
Melanie Vander has packed her suitcase and virtually run away from home to her friend's lake house, cowering under the pretense of completing her novel under deadline, when in reality she recognizes that she and her husband have slowly drifted apart; thoughts of the future so confusing that it seems safer to escape into the alternate reality of her work in progress. But there is no solace there, either. Craig Vander is under tremendous pressure; building custom built homes during a recession has drained his resources. Unfortunately, putting his own home on the market looks more and more like the only alternative. Why hasn't he been honest with Melanie before now about their bleak financial straits? The answer is obvious, it's because their recent conversations have either been one-sided or have ended in disagreements; Melanie's increasingly unfocused thoughts being driven by the imaginary characters in her novels, rather than by her very real husband. Fans of contemporary Christian fiction focused on married couples will enjoy this touching, insightful book! Uniquely written from the first person point of view of 4 people--2 couples--giving an upfront and personal look into their struggles. As they seek solutions to problems they are facing, revealing underlying spiritual and emotional issues, it felt quite therapeutic to see how they resolved their conflicts. The main character, Melanie, is an author and her work in progress becomes part of Fans of contemporary Christian fiction focused on married couples will enjoy this touching, insightful book! Uniquely written from the first person point of view of 4 people--2 couples--giving an upfront and personal look into their struggles. As they seek solutions to problems they are facing, revealing underlying spiritual and emotional issues, it felt quite therapeutic to see how they resolved their conflicts. The main character, Melanie, is an author and her work in progress becomes part of the story as well, adding a special sideline to her life. I wanted to say a few choice words at times to her husband, Craig! A look at the many different sides to grief, and how God allows difficult circumstances to get our attention, meeting us in our brokeness, was one key spiritual theme; searching for peace and a place of belonging, defining home, was another. This was my first Ginny Yttrup book and I quite enjoyed it. The story was very different from any I've read and her writing style just made everything seem so real and authentic. This was a book that was easy to read yet, at times, difficult to read. It wasn't a light, airy read but one that is relatable. From the beginning I could see the detachment between Melanie and Craig. The two have been married for twenty-three years and it was easy to see that they were perhaps stuck in a rut. It was alm This was my first Ginny Yttrup book and I quite enjoyed it. The story was very different from any I've read and her writing style just made everything seem so real and authentic. This was a book that was easy to read yet, at times, difficult to read. It wasn't a light, airy read but one that is relatable. From the beginning I could see the detachment between Melanie and Craig. The two have been married for twenty-three years and it was easy to see that they were perhaps stuck in a rut. It was almost as if both had given up on their marriage and were just going through the motions. Melanie, an author, lives more in a fictional world than her husband, Craig, who builds houses. Craig is the one who lives in reality and is more of a take-charge kind of person. It was easy for me to see his frustration with his wife. There was so much that seemed real to this story that it left me wondering if the author was using her own life as inspiration for parts of the story. I did enjoy the way the author went back and forth and told the story from both characters point-of-view. It kept the story feeling more authentic and also less confusing since the reader also gets to read snippets of the book Melanie is writing. The next-door neighbors were a nice addition to the story and especially the struggles of Jill. Jill is a freelance editor and works with Melanie. It is hard to say the two are close friends at the beginning but it is easy to see the shift in their relationship as the story progresses. Jill is facing her own battles and the chapters dedicated to her and her problems were a unique addition to the story. As a lover of books and someone who enjoys reading about the writing process, I loved the way the author incorporated the process of writing a book into the story. This is another one of those things that made the story that much more real. Some of the terms she used were familiar to me and lent another layer of reality to the story. If you are looking for a light read then don't pick up this book. This is a heavier read so if you are looking for a book that is full of emotion then this would be a great book to pick up. This would be a terrific book club selection. 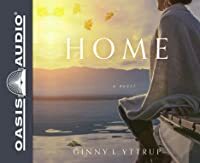 Home by Ginny Yttrup was so beauitful in an emotional blend of feel goods and grief. I’m still trying to wrap my mind around the emotions that are swirling within me right now after reading this one. Ginny portrays the lives of three main characters, Jill, Melanie and Craig. Melanie and Craig are married. The emotional roller coaster each of these characters ride resonated deep within my own soul. You felt what they felt in this novel because Ginny made them all so real. 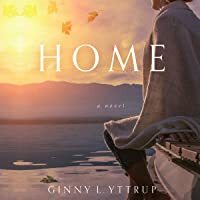 I felt that I was, too, l Home by Ginny Yttrup was so beauitful in an emotional blend of feel goods and grief. I’m still trying to wrap my mind around the emotions that are swirling within me right now after reading this one. Ginny portrays the lives of three main characters, Jill, Melanie and Craig. Melanie and Craig are married. The emotional roller coaster each of these characters ride resonated deep within my own soul. You felt what they felt in this novel because Ginny made them all so real. I felt that I was, too, living the lives they were living, going through the hardships they were experiencing. In all honesty, for anyone that reads this, at least for me, the book will really resonate with you. We all experience grief, hardships, and anxiety. I felt at peace after reading this book. I felt that there is truly hope in this world, even on the days it seems impossible. Home, written by Ginny L. Yttrup, is the first book I've read by this author. What a delightful read...full of emotion! Romance, sadness, grief, longing, and lots of stuff between. I found the beginning of the book hard to get into, BUT after I got going...it was a keeper! I'm sure I'll read it again. It's a book writer's life, an editor's life and the book the writer is writing. Very unique! I've never read anything like it. I have always been a fan of first-person POV's and this one has first- Home, written by Ginny L. Yttrup, is the first book I've read by this author. What a delightful read...full of emotion! Romance, sadness, grief, longing, and lots of stuff between. I found the beginning of the book hard to get into, BUT after I got going...it was a keeper! I'm sure I'll read it again. It's a book writer's life, an editor's life and the book the writer is writing. Very unique! I've never read anything like it. I have always been a fan of first-person POV's and this one has first-person POV's from three different characters. Loved that part especially! Strongly recommend this read if you love contemporary romance with a twist...addresses grieving issues, OCD, PTSD, and a host of other emotions. What happens when we just “check out” of life? Maggie has hit a brick wall in her writing and it seems to have spilled over into her marriage as well. In her mind, the daily struggles are happening more and more and Craig doesn’t seem to be able to pull her out of her funk. Craig is struggling with a sharp downturn in work and finances which are leading to some heart-wrenching decisions. With Maggie off on a self-imposed retreat to meet her writing deadline, Craig feels as if he’s battling on hi What happens when we just “check out” of life? Maggie has hit a brick wall in her writing and it seems to have spilled over into her marriage as well. In her mind, the daily struggles are happening more and more and Craig doesn’t seem to be able to pull her out of her funk. Craig is struggling with a sharp downturn in work and finances which are leading to some heart-wrenching decisions. With Maggie off on a self-imposed retreat to meet her writing deadline, Craig feels as if he’s battling on his own. Can their marriage survive this time in the wilderness or will all of this be too much for them to overcome? No sense in worrying about it, just go BUY THIS BOOK! This book is another great example of why I enjoy any book by Ginny Yttrup. She writes from the first person perspective, but alternates each chapter with a different character. This gives you some great insight as the story unfolds into not only the character interactions, but also what they thought and intention was for those interactions. Her characters are not fake, as they seem to be just like me or anyone that you know. I guess that’s what makes you feel so committed to their situation and hoping that everything turns out for the best. Is this a "guy's book"? This doesn’t have any major suspense or action scenes, but it does show you a man who’s willing to fight for his wife and the life that he knows God intended him to have. With that being said, then yes, this should be a book that every guy reads. Every so often, you will read a book that will touch your heart and change your life. Home was one such book for me. Like Melanie, I also dive into the fiction world rather than confront the uncomfortable truths around me. Needless to say, I understood her quite well. For me, it was icing on the cake that she was a writer as I love reading books about writers. In Craig’s struggles with a failing economy, a job on the brink, and a wife not emotionally present, I could easily see my husband. The man Every so often, you will read a book that will touch your heart and change your life. Home was one such book for me. In Craig’s struggles with a failing economy, a job on the brink, and a wife not emotionally present, I could easily see my husband. The man who carries the weight of the real world on his shoulders while his wife plays in imaginary ones. Jill, Melanie’s best friend and editor, fights her own demons and it broke my heart to watch her struggle. In her, I felt a connection as well. It’s never easy fighting demons, and I felt Ginny L. Yttrup portrayed the battle incredibly well. Each character was brought to life in such a way they all felt real. They could have been people living in your same community, or like me, you could feel a personal connection. I wish I could meet them and call them friends. Written in first person, the book switches between Melanie, Craig, and Jill. It is clearly labeled which character is speaking, and once in the chapter, it’s easy to keep track of whose viewpoint you’re reading. I’ve read books in which this wasn’t the case, so it was a welcome respite to see it done well. This book easily rivals anything Debbie Macomber has written, but includes a Christian viewpoint. It was beautifully written and I couldn’t put it down until I’d read the last word. I would recommend it to anyone who enjoys Christian books with a chick lit vibe. I was super-impressed by Words, the first Ginny Yttrup book I read. The second, Invisible, was a little harder to get into. And Home was a little harder again. I know Words was partly based on Ginny’s own story, and I suspect part of Home is as well (a novel about a novelist? Who ends up writing a novel titled Home? It’s easy to see why I might think that). I know authors are told, ‘write what you know’. And obviously, authors know writing novels. But I have to admit that I’m not a big fan of nov I was super-impressed by Words, the first Ginny Yttrup book I read. The second, Invisible, was a little harder to get into. And Home was a little harder again. I know Words was partly based on Ginny’s own story, and I suspect part of Home is as well (a novel about a novelist? Who ends up writing a novel titled Home? It’s easy to see why I might think that). I know authors are told, ‘write what you know’. And obviously, authors know writing novels. But I have to admit that I’m not a big fan of novels featuring novelists as main characters. I don’t mind novels about journalists or bloggers. But something about a novelist as a main character makes it harder for me to suspend disbelief—some novels have done it (Denise Hunter and Kaye Dacus are two, but their novels are fun romance. Home isn’t). Home is told in first person point of view. This isn’t something that usually bothers me, but it bothered me with Home because it’s told from the viewpoint of several different characters, and I kept having to go back to the beginnings of chapters to work out who the viewpoint character was. I find it easier if first person is one character. The result was it took me longer than normal to get into Home, and when I did, I found myself engaging less with Melanie’s story (the novelist), and more with the story of her neighbour and editor, Jill. I did get into Melanie’s story, and even into Craig’s (her husband), but it took a while. And that makes it a hard novel to review. The ending was good, but it took a long time to get there. The writing was excellent, particularly in the second half, and there was a lot about Melanie I could relate to. I liked the quotes at the beginning of each chapter. And I liked the way the characters, especially Craig, had a solid Christian faith. Overall, Home is a novel about loss and grief, and learning to cope with both. It’s uplifting and encouraging, but not a book to pick up if you’re looking for a light read. Wow! I really loved this book. A powerful story that explores many different emotions, some of the struggles mirrored some that I have had in my life and like Craig and Melanie it made my faith stronger. I frankly don't know anyone who writes women's fiction as well as Ginny Yttrup. Even though it's fiction, there's such a ring of truth in them that you'd swear Ginny's writing it from her own life. When the housing market took a dive, many building and architectural contractors went out of business. Those who survived had to diversify and cut back. Craig is one whose business has suffered--or strangled, nearly. He and Melanie discuss putting their own self-designed dream home on the market and mo I frankly don't know anyone who writes women's fiction as well as Ginny Yttrup. Even though it's fiction, there's such a ring of truth in them that you'd swear Ginny's writing it from her own life. When the housing market took a dive, many building and architectural contractors went out of business. Those who survived had to diversify and cut back. Craig is one whose business has suffered--or strangled, nearly. He and Melanie discuss putting their own self-designed dream home on the market and moving to something smaller. Or rather, Craig tries to discuss it. Melanie closes herself off. Melanie is a writer with a deadline that's looming way too close, and she can't get her characters to cooperate. What she needs is a break, and a friend provides her with the perfect retreat--a house on beautiful Clear Lake--for free. She can escape, but will she return even when--if--the book is ever finished? Jill and Marcos live next door, and Jill is the closest thing to a best friend that Melanie has. Jill has problems of her own: She is OCD on steroids. She has frequent nightmares of someone dying, and she's literally terrified that someone in her family is going to die from a germ that found its way into their sterilized house or a car wreck or whatever. The dreams are so real they seem more like a memory than imagination. Marcos is beyond worried about her. With tension on every page, this book is nearly impossible to put down. Available from Amazon and Barnes and Noble. Ginny Yttrup puts together a novel so compelling, so intriguing, it's very hard to put down. I stayed up till nearly 3:00 AM to finish the book. Her characters are honest, and they all have a voice of their own. One of the quirks of this book that makes it work is the fact that several of the characters are authors and one of the main characters is trying to meet a deadline for her book, but she's having a hard time getting words to paper. Melanie describes herself as a pantser type author--one Ginny Yttrup puts together a novel so compelling, so intriguing, it's very hard to put down. I stayed up till nearly 3:00 AM to finish the book. Her characters are honest, and they all have a voice of their own. One of the quirks of this book that makes it work is the fact that several of the characters are authors and one of the main characters is trying to meet a deadline for her book, but she's having a hard time getting words to paper. Melanie describes herself as a pantser type author--one who writes by the seat of her pants, but she's having a hard time with her new novel. Valerie is a therapist who has a lake cabin that she uses for refuge and offers it to Melanie. Craig is Melanie's husband and a builder whose business had dropped off during the recession. Jill and Marcos are Melanie's and Craig's next-door neighbors and dearest friends. Jill is having a bit of trouble with obsession and with nightmares. Melanie takes Valerie up on her offer of the lake cabin, and Jill eventually comes to visit Melanie, needing the mental break from daily life. The tagline for the book should be "Sometimes you just have to run away from home to find out where home really is." This is a five star book, two thumbs up, and a new novel to read. Home, it should be the ultimate refuge, but for novelist Melanie Vander and her husband Craig it is merely a place they both sleep. Not only are they in financial difficulty if the don't do something soon they may lose everything. Their next door neighbors Carlos and Jill are also facing a crisis Home is a very engaging book that examines two couples at life's crossroads. I enjoyed this book immensely. The characters and situation were very plausible. I loved the gentle reminders God gave each o Home, it should be the ultimate refuge, but for novelist Melanie Vander and her husband Craig it is merely a place they both sleep. Not only are they in financial difficulty if the don't do something soon they may lose everything. Their next door neighbors Carlos and Jill are also facing a crisis Home is a very engaging book that examines two couples at life's crossroads. I enjoyed this book immensely. The characters and situation were very plausible. I loved the gentle reminders God gave each of them as they faced their own crisis. Although this is my first book by Ginny Yttrup, it will certainly not be my last. Melanie’s husband, Craig, has his own problems, including a recession that’s threatening his business. Waning finances, a looming home foreclosure, and a wife who’s checked out emotionally have Craig feeling as though he’s carrying his burdens alone. When his client, the beautiful and single Serena Buchanan, offers him a solution to his financial woes, he’s tempted by more than her offer of a business solution. Ginny is the award-winning author of Words, Lost and Found, Invisible, Flames, and her most recent novel, Home, which releases April 1, 2017. She writes contemporary women's fiction and enjoys exploring the issues everyday women face. Publishers Weekly dubbed Ginny's work "as inspiring as it is entertaining." When not writing, Ginny coaches writers, critiques manuscripts, and makes vintage-style jewelry for her Esty shop, Storied Jewelry. She loves dining with friends, hanging out with her adult sons, or spending a day in her pajamas reading a great novel. Ginny lives in northern California with Bear, her entitled Pomeranian. Home was a book that was a pretty gripping story of grief, temptation, illness, and what keeping secrets can do to a family. Mostly though this was a story about grief, all kinds, and how we need to face it, a human emotion and a necessary next step in the moving on of our lives. Whether it is a loss of a loved one, dream, career, or financial security grief must be faced head on. We as human beings need to go through the stages no matter how painful. 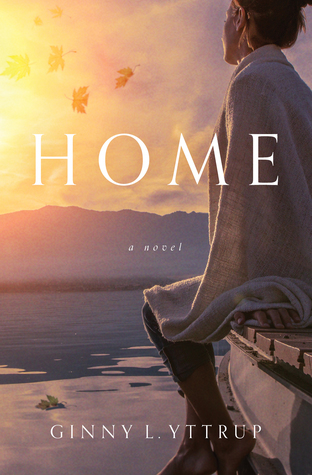 The author masterfully told this story throug Home was a book that was a pretty gripping story of grief, temptation, illness, and what keeping secrets can do to a family. Mostly though this was a story about grief, all kinds, and how we need to face it, a human emotion and a necessary next step in the moving on of our lives. Whether it is a loss of a loved one, dream, career, or financial security grief must be faced head on. We as human beings need to go through the stages no matter how painful. The author masterfully told this story through three different viewpoints; Melanie the author, her husband Craig, and her best friend and next door neighbor, Jill. We are also given two of the characters viewpoints in the novel that Melanie is writing. All of these characters felt like they were my friends too. This story made me think and brought tears to my eyes, but in no way is it depressing. This is my very first book Ms. Yttrup, and her writing this story in the way she did simply moved me. It was lovely and a soul stirring novel not to be missed. I received a copy of this book for free from the publisher. I was not required to post a positive review and the views and opinions expressed are my own. Grieving is not something any of us would choose, and yet it's something we all face at one time or another. Sometimes we'd rather pretend it doesn't exist than to face it head on. Several of the characters in Home are grieving. They are facing difficult situations, and they handle their emotions differently, but ultimately they each must go through a learning and healing process. I love that Home doesn't shy away from this difficult topic but presents loving and wholesome perspectives on the proc Grieving is not something any of us would choose, and yet it's something we all face at one time or another. Sometimes we'd rather pretend it doesn't exist than to face it head on. I love that Home doesn't shy away from this difficult topic but presents loving and wholesome perspectives on the process. The characters wrestle with their faith, and sometimes each other, as we each must do. Whatever the cause of our grief, there is hope and healing to be found, and Home shows the way there. Whether you are struggling yourself or are walking alongside someone else who is struggling with grief, Home is sure to be an encouragement to your heart. This story was quite a well written read where the characters struggles were definitely ones that could be faced by just anyone you may know. For Melanie and Craig were having some real hard times in their marriage where one could at one point or another not know to whom to feel more sorry for. Less not forget those neighbors who added quite a lot to the read. This is definitely one of those reads that will promote a lots of thoughts that will touch one just about on any level. "Home" is of a real story of a 'family relationship, trust, romance, sadness, longing, love and less not forget a prayer' as each one of thee well developed characters will have their own struggles in trying to find there way home. Will these characters be able to overcome their struggles? "Home" will definitely help one to understand more about relationships that are often faced in today's society. My thoughts - I went into this read thinking it would be an ordinary Christian Contemporary following a woman that’s got a choice to make. I honestly wasn’t sure if I would even get invested in the story line.. but I picked it up then couldn’t put it down.. it made me question somethings in my own life. Each one has choices to make and honestly I fell in love with / connected with each character. I rated it a 4 because I loved one of My thoughts - I went into this read thinking it would be an ordinary Christian Contemporary following a woman that’s got a choice to make. This is the second book I've read by Ginny Yttrup and it's just as good if not better than the first one. Her stories carry lots of psychological drama. Home had multiple layers. The characters were ones I could deeply care about, their issues, their problems and their outcomes. I got throughly engrossed in the story and could almost feel my presence in the pages of the book. The descriptions of the surroundings in each location was easily imagined. It was emotional and heartwarming. Full of unr This is the second book I've read by Ginny Yttrup and it's just as good if not better than the first one. Her stories carry lots of psychological drama. Home had multiple layers. The characters were ones I could deeply care about, their issues, their problems and their outcomes. I got throughly engrossed in the story and could almost feel my presence in the pages of the book. The descriptions of the surroundings in each location was easily imagined. It was emotional and heartwarming. Full of unresolved grief, past issues and confusion at times as the characters try to understand each other. Craig becomes closer to God and prays numerous times for his wife Melanie while she's gone on a writing retreat. It was interesting to read through the eyes of an author as she struggles with a novel she is trying to finish but hidden emotional issues are causing her to have writers block. She and her husband are also having financial problems. Her best friend next door is also struggling with mental issues that causes strife within her family. I especially loved the underlying symbolism, or what I took as symbolism for the home, not always a physical place but a place in your heart or with those you love and ultimately home in Heaven. I have never read a book by Ginny Yttrup but I sure will again. This book was so good it was like reading 2 books into one. Once I started reading I couldn't put the book down. The characters are very developed. Watching Melanie's life come through the life of her character. By working together her and her friend Jill see their lives and what needs to change. Awesome story. "I received a complimentary copy of this book from Barbour Publishing and was under no obligation to post a review." Not completely what I expected from the back cover. There's really two stories going on, but the characters are connected and the stories flow together. It's a very cerebral married romance. Very good but not your typical Christian fiction. Really enjoyed it, just like I have Ginny's other books. This is not just the story of Melanie and Craig. This is a story of their friends, mental illness, depression, OCD, the thought of an affair, children, marriage in general, and the hardships that marriage can face, especially after a great loss. I found myself completely enthralled with this story. I couldn't stop reading. Whether it was Melanie's POV or Craig's, or her best friend's, it didn't matter. It grabbed ahold of me and wouldn't let go. Perhaps it is because I have felt what the charact This is not just the story of Melanie and Craig. This is a story of their friends, mental illness, depression, OCD, the thought of an affair, children, marriage in general, and the hardships that marriage can face, especially after a great loss. I found myself completely enthralled with this story. I couldn't stop reading. Whether it was Melanie's POV or Craig's, or her best friend's, it didn't matter. It grabbed ahold of me and wouldn't let go. Perhaps it is because I have felt what the characters felt, or because I am going through in my life now what they are going through, or maybe it is just because the story is so well written, it filled my heart and mind. Melanie and Craig have been married for numerous years. He's a contractor/construction worker, building the grandest of homes. She's an author, and presently is having the hardest time putting her thoughts into words, her words into a story, and even more, keeping her thoughts from wondering. She has an idea to change the story, but her editor isn't thrilled. So she tries to make the story fit, but it just isn't happening. A friend of hers offers a beach house to get away to for some time, to find peace, to find the story that needs to be written. While this is going on, her marriage is on the rocks. Is it just Mel that checked out? Or did Craig check out too? Does it have anything to do with the woman Craig has been renovating a house for? Or is it due to a loss so great, so heartbreaking, that when never dealt with properly, lead to the effects of this shattering story of theirs? Even when trying to find their own place in their relationship, their work, this world; both Craig and Melanie are still there for their best friends, their neighbors, who are having a go of their own. Can they keep their own heads above water (or wine), or do their own troubles and turmoils tear their marriage apart? Or will they truly find themselves called back home? I struggled to get through this book. While the author is clearly a talented writer, and there are a few nuggets of wisdom buried inside, this was not a favorite read for me. The story attempts to deal with real life issues (marriage, lies, withdrawing, emotional and mental confusion, etc.) which I expected from the description of the book, but I almost felt like this was two different stories. Melanie’s best friend gets as many pages if not more than the heroin and her husband. While the friends I struggled to get through this book. While the author is clearly a talented writer, and there are a few nuggets of wisdom buried inside, this was not a favorite read for me. Melanie’s best friend gets as many pages if not more than the heroin and her husband. While the friendship becomes a valuable part of them, I felt like Jill should have had her own story. The constant story hopping among three characters POV repeatedly took me out of the tale, and left me wondering where we were chronologically. While there are issue inside readers may relate to, I would have a difficult time pointing to this book as a good source for dealing with them. I might not even recommend this as an enjoyable fiction piece. I wasn't sure I was going to like this book when I chose it. Oh was I wrong! This is a very well written story that is actually told in three voices along with the characters in the book that Melanie is writing. Sound complicated? It had to be complicated to write and author, Ginny Yttrup did an incredible job with it. This story truly touched me on a personal level and could touch the lives of many people with differing conflicts in their lives. It is so much more than the descriptive paragraph I wasn't sure I was going to like this book when I chose it. Oh was I wrong! This is a very well written story that is actually told in three voices along with the characters in the book that Melanie is writing. Sound complicated? It had to be complicated to write and author, Ginny Yttrup did an incredible job with it. This story truly touched me on a personal level and could touch the lives of many people with differing conflicts in their lives. It is so much more than the descriptive paragraphs to get a potential readers attention. This is a book that will stay with me for quite awhile. I loved it. This is for anyone who is dealing with the struggles of life such as financial heartache, infertility, marriage fears, loss and mental of physical illness, Incredible, wonderful job touching on these things showing weakness, strength and faith. My words can't do it justice. Home by Ginny L. Yttrup is a thought provoking and compelling book. A book that is not a light read, yet there are some light moments in it. A book about characters who have very real and troubling problems to deal with, yet find the strength and faith in family and God to work through those problems. A book about home, a place we all long for and yet not necessarily in the sense of an actual place but something more. Yttrup masterfully touches on the multifaceted issue of grief and the oft misu Home by Ginny L. Yttrup is a thought provoking and compelling book. A book that is not a light read, yet there are some light moments in it. A book about characters who have very real and troubling problems to deal with, yet find the strength and faith in family and God to work through those problems. A book about home, a place we all long for and yet not necessarily in the sense of an actual place but something more. Yttrup masterfully touches on the multifaceted issue of grief and the oft misunderstood issue of mental illness weaving faith throughout the story. And the faith is in a God who is there, who is present to bring the struggling one home. Home is an amazing book that will resonate in the hearts of many a reader. This novel is written from the points of view of several characters, which helps move the story along and gave me a rounded view of the main characters. The characters deal with a variety of crises that lead them to face the past and issues they have never dealt with, like grief and family secrets. Ultimately you cannot run away forever. I found myself searching my own mind and heart as I read. The author leads in to each chapter with a literary quote that in some way summarizes the chapter to fo This novel is written from the points of view of several characters, which helps move the story along and gave me a rounded view of the main characters. The characters deal with a variety of crises that lead them to face the past and issues they have never dealt with, like grief and family secrets. Ultimately you cannot run away forever. I found myself searching my own mind and heart as I read. The author leads in to each chapter with a literary quote that in some way summarizes the chapter to follow. I usually ended up re-reading the quote after I finished the chapter, and found they were dead on. I also like the emphasis on serious prayer--fervent is a word used in the Bible to describe it. The novel within the novel is a good way to show what Melanie's thought process was. I was almost as eager to see how that story turned out as the main one. All in all this is an enjoyable book, though not terribly deep, but it gave me something to think about.